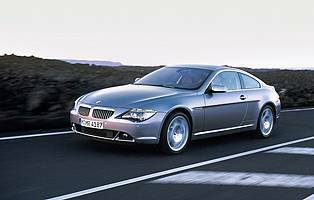 You can't get a more radical departure from the premium coupe norm than BMW's 6 Series. Granted, it still fits the grand tourer concept as far as how it driver, but there's no escaping its challenging looks. The first generation 6 Series was a conventional coupe of generous proportions. Conceived at a time when conservative styling was the norm, it attracted many fans. 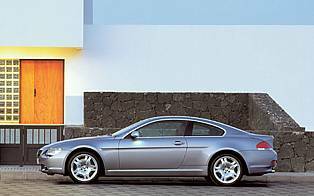 The 6 Series for the 21st century continues the old car's tradition in being a smooth, competent and long-legged cruiser. However, where the two cars differ is, obviously, in the way they look. Second time around and BMW's design language has gone through a major transformation. After many years of producing cars that, although were good to drive, failed to ignite any serious passion, the new policy has acted as a catalyst - you either like the car or loathe it. And there's no question that the 6 Series look is both a head turner and talking point. The radical approach is only skin deep, though. Inside, the car's cabin will be familiar to anyone who's sat in a 5 Series. That said, the clean lines, uncluttered fascia and familiar controls are welcome features. BMW's much talked about iDrive system is the main reason for the reduced button count, although it's not universally liked and requires a fair bit of acclimatisation. One thing that doesn't need a lengthy explanation is how the car goes. For a large coupe the 6 Series is surprisingly nimble - even in entry-level 630i guise. You can have fun in this car despite its touring credentials, and the 3.0-litre variant never feels underpowered. Of course, the V8 650i delivers a bigger thrill and the V10-engined M6 is more super car than super tourer. Leaving aside the car's looks for a moment, it's difficult not to like the 6 Series for what it can do. It's no family car, but if you still need executive saloon levels of boot space this is one option that should be on your shopping list. And, unlike so many other entry-level BMWs past and present, the least expensive 630i will rarely leave you wishing you spent more money on extra horsepower. The 6 Series isn't a cheap car. In fact, spend too long with the options list and it will be a very costly experience. Just remember that the various extra toys add little to the car's residual value. Staying in the present, combine the car's modest fuel economy with its premium insurance grouping and you'll need more than a few pennies to run it - and that's just the entry level 630i. Realistically the 6 Series is a two-seater and you won't win many adults friends if you ask them sit for even a short period in the back seats. Apart from the tricky access, head and legroom is sufficient only to cater for the needs of children. That aside, the car's boot is a decent size and good for a couple of soft cases, while the cabin boasts a similar number of storages spaces as the 5 Series on which it's loosely based. BMW's much talked about iDrive is present in the 6 Series, but it's not all bad. Most complaints come from people who choose not to read the instruction manual, as to do so makes it harder to understand how it works. Although not perfect, it does make controlling the car's many systems less of a chore. You're aided by a large colour display screen - something the optional sat-nav takes full advantage of. Basic audio controls are helpfully duplicated on the steering wheel, while the main dials and supplementary displays are clear and easy to read. Front seat passengers sit in supportive seats boasting numerous levels of adjustment. Minimal head and legroom in the back means rear seat occupants are less well catered for. Road and engine noise are filtered out when you're cruising, although the later is evident when you're pressing on. Stick to the standard size wheels and you minimise the chance of experiencing a jarring ride over poorly surfaced roads. 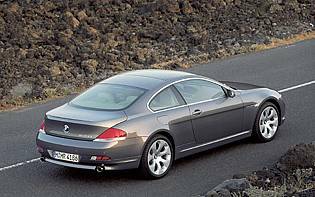 A car like the 6 Series attracts a lot of attention, but not all of it will be good. For that reason, BMW's alarm and immobiliser package does a good job of protecting your investment. However, despite the convenience of remote central locking and the optional keyless ignition, it would be worth considering an aftermarket tracking device to help retrieve the vehicle if the worst ever happened. When you're paying a lot for a car like this you expect a full complement of safety features. Thankfully the 6 Series wants for nothing in this department. All the usual electronic stability aids are present, as are the requisite number of airbags. Keen drivers haven't been ignored, though, as the ESP only cuts in when absolutely necessary and is rarely intrusive when the car is driven enthusiastically. Despite its size, the 6 Series is a willing performer. You don't need the V8 or M6 variants to have fun, as the six-cylinder car is surprisingly good in its own right. It thrives on revs and the manual gearbox is slick, although the long throw lever doesn't like being rushed - the auto option is better. Elsewhere, the suspension is firm but not uncomfortably so, while the car as a whole is just as happy on the motorway as it is around town or on your favourite A-road. This car is not designed to accommodate a family, but at least you could get by for a while before children grow up too quickly. The car's back seats will accommodate small ones with ease, although access via the folded front seats will be tricky. On the upside, the big BMW's boot will swallow most regular-shaped items with ease, even if the boot aperture is a little shallow. In a word, no. Not, at least, if you're of a nervous disposition as the car can feel intimidating in the wrong hands. The 6 Series is a costly commodity and the last thing you need is to feel uneasy manoeuvring it around town. 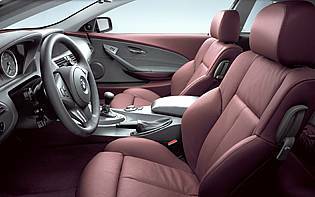 It's also no slouch, so self-restraint would have to form a large part of a novice's driving routine. And even if you could afford one, the insurance premium would be considerable. The BMW badge does most of the work, but it's hard not to like the 6 Series thanks to its imposing looks and road presence. Quality-wise, the 6 Series shares many design cues with the 5 Series, and it's difficult to find fault with dark interior combinations. Conversely, the lighter colours are less attractive and lack a premium feel. Access to the front two seats is easy thanks to the car's wide opening doors, although they'll also be a curse when you're in a cramped car park. That aside, you do sit low down, which might prove a challenge for the less nimble when it's time to get out. Rear seat occupants don't fare quit so well, as clambering through the gap between folded front seat and door pillar will prove undignified for many adults. Getting in can be even more problematic. The standard unit is competent enough, but there are also more powerful systems, CD changers, phone options and sat-nav to tempt you with. The latter, in full-colour specification, is an excellent system and is fast acting if you go off route. All systems are controlled via the iDrive, which is not intuitive at first but gradually becomes easier to use with practice. Remote audio controls on the steering wheel are a useful feature. From the exterior colour palette, dark hues work best - especially black. Complimented by the subtle application of chrome trim, the complete 'look' helps give the car its larger than life road presence. Dark trim works best inside, too. Gloss black or carbon trim is recommended, along with black leather seats, as lighter colours tend to cheapen the interior ambience. The 6 Series is a big car and sitting low down it's not easy to see the bonnet, let alone rearwards and the boot. At least the power assisted steering requires little effort at low speeds, and the parking sensors prove invaluable. Make no mistake though, you'll need plenty of room to manoeuvre this car, and it pays to take it slowly in tight multi-storey car parks. Petrol engine options - 3.0-litre (258bhp); 5.0-litre (367bhp), 6.0-litre (507bhp). Six-speed manual gearbox is standard fit, with auto 'box a cost option. M6 comes with seven-speed semi-auto gearbox as standard. Trim levels: base and Sport, although standard equipment also varies according to engine option.